“The traveller sees what he sees, the tourist sees what he has come to see”. – Gilbert K. Chesterton. At 07:30 a.m., my phone rang, the voice on the other side just said, ‘Hi, have you realised that we have never gone on an international holiday together as a family? It’s time we did. Think about it’. That was my sister-in-law on the other side. Turkey, Kenya, Cancun (Mexico) and Egypt were short-list and post endless debates, fights, accusing each other of being a miser, bore and what not, at last we agreed on Egypt. Word of caution: It isn't easy to get four people on a common ground. Personally, I always wanted to visit Egypt as a child. The dates were decided for early February, perfect weather, dime a dozen places to visit, from Luxor to Sharm el-Sheikh to Cairo. The research mode on! We roped in online travel operators to help us finalise our itinerary. Most operators offer fixed packages with city plus cruise or city plus city combo. All these packages were 5N / 6D or 7N / 8D at exorbitant prices and had very little flexibility. We had an extremely clear agenda, Cairo and Luxor had to be done for it’s for historic relevance, Sharm el-Sheikh for the beaches and underwater fun activities. The challenge ahead was to squeeze in all these places in 7 nights and 8 days. This was when Musafir.com came to our rescue with its personalized Egypt tour package. Finally the D-Day arrived; all bags packed and the finicky traveller that I am, checklist constantly kept replying in my head; passport, tickets, forex, hotel bookings (all check), and wife (double check) hahaha!! Forgetting her could be injurious for me! You know the holiday is going to be epic, when you get bumped into the Business class. As Economy class travellers, we get clumsy in the lap of luxury, behave like kids let loose in a candy store. It’s hard to absorb all the fancy stuff; we were busy sticking right things in the wrong holes. Hold on, I meant stuff like the mobile charger and headphones (but I like the way you think). Few hours into the flight, I was shamelessly passed out, snoring loud (easily put the aircraft engines to shame). My wife vehemently nudged me; she was really embarrassed and on the verge of disowning me. With my half shut eyes, I looked at my watch it was 09:00 a.m. and I suddenly felt a jerk. People started clapping like they had doubts on the pilots' flying skills. The airport was almost deserted and there was a chill factor in the air. We looked at each other and unanimously said ‘Welcome to Luxor Singh-ams’, (phrase from a Bollywood flick). 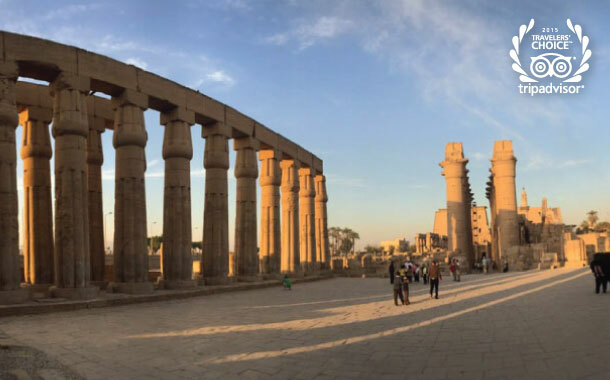 Luxor, an iconic, historic town features landmarks like Luxor Temple and Karnak Temples, Tombs at Valley of the Kings and Queens, Hatshepsut, and Colossi of Memnon. We stayed at Hotel Mercure Karnak on the Nile. After 9 hours of travel, quite frankly we wanted to hit the sack to recharge our batteries. Post lunch, it was time to start exploring Luxor Temple and Karnak Temple. 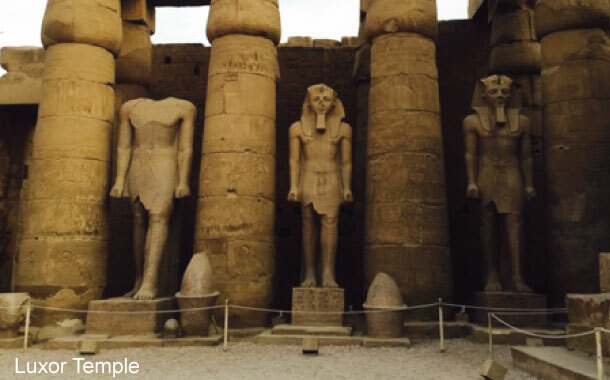 Both temples are one of its kind with open air museum, larger than life statues of the Pharaohs, ancient scriptures on the wall depicting birth, death, relationships, and huge pillar that was more than 10,000 years old standing intact. Our guide made it all the more interesting with his recital style, hand gestures and knowledge. Each frame has a story hidden somewhere. In the later part of the evening, we went to Karnak temple for its light and sound show considered to be one of the best. By this time, we were hungry, exhausted, but had a strong will to go on. On the way, we spotted a roadside café with a variety of meat slowly getting roasted on the grill. Without thinking for a second, we placed our order for shawarma, chicken burger with Egyptian mint tea and Turkish coffee on the side. Nothing is more blissful than a piping hot cuppa tea and yummilious authentic shawarma on a cold winter evening. I can still recollect the taste and my mouth is watering even now as I write about it. We literally wiped the plates clean with slight traces of ketchup on the edges. It was time to head to the temple for the light and sound show at Karnak Temple. At first, we thought we will be made to sit at an amphitheatre to show us a whole lot of mumbo-jumbo with lights and sounds, but to our surprise, this was something completely different. The temple is split into 5 or 6 sections. We had to walk and spend 15 to 20 minutes in each section with lights, music, audio thrown in from all the directions. In the last section, story is narrated through projection on the water and the reflections formed thus are extremely captivating. You have to see it, to experience it; my words will not do justice. The entire show lasted near about 2 hours. We could not stop talking about it on our way back to the hotel. By the time we retired, it was midnight. We started early the next day. It was an hour’s drive to the Valley of the Kings and Queens on the west bank. We drove through the beautiful country side, with our driver Ahmed telling us stories of his days in Muscat, new president, unemployment, his military life, etc. It was a crash course of his life, wives and kids. He also gave us tips on how to handle the locals. On our way, we drove past the house of Howard Carter, an archaeologist and Egyptologist who became famous after discovering the Tutankhamun’s Tomb. His house lies on top of a hill 5 minutes away from the Valley of Kings. Everything is very systematic, out of the 20 odd tombs the entry ticket gives access to only 3 tombs, for access to more tombs one needs to pay extra. However, to visit Tutankhamun’s Tomb there is a separate ticket. All the tombs are empty and most of the relics are now kept on display at the Museum of Cairo. You may witness well restored drawings on the wall in other tombs. At Tutankhamun's Tomb, his skeleton is kept in a glass case covering him with a white cloth from neck till the ankles. Most of the tombs are 5 to 10 meters deep into the mountains with narrow passage entrances and steep climbs. 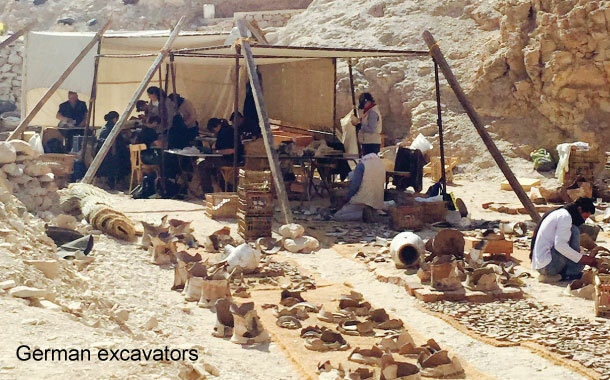 We came across a team of German historians and excavators restoring their last find in that part of the Valley of Kings. Ahmed suggested a slight detour to the souvenir factory where we could buy mementos and see how workmen still used old tools to carve out miniature replicas of famous monuments made from alabaster, granite, and onyx. The art is passed down from generations. It is a unique skill that can’t be acquired easily. Our next stop was the Queen Hatshepsut Temple. We made a quick trip inside and it did not have much to offer besides the crazy climb up the step. 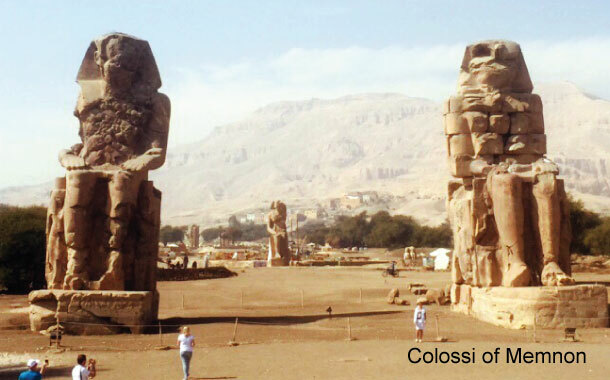 Our last destination was Colossi of Memnon where two grand Pharaoh structures with hands resting on their knees are facing the Nile. We spotted two small structures carved next to their legs; Ahmed explained these are of his wife and mother. It is hard to capture them in a single frame but somehow we managed. No trip is complete without trying out the local food and I am of the opinion that one needs to eat at the local joints and not at fancy upmarket restaurants or hotels. Ahmed took us to the El Hussein Restaurant. The place is cozy with courteous staff, wall to wall wooden interiors and most of all clean ambience. 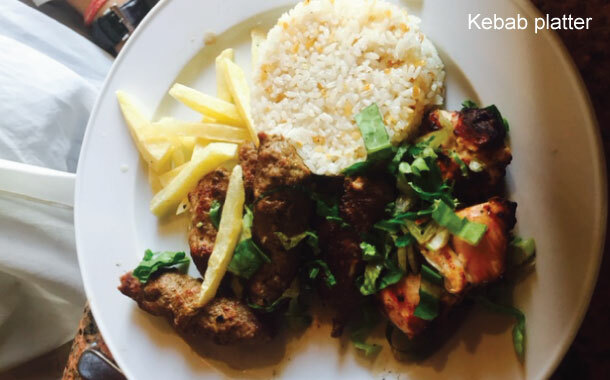 Before we started, they served us a traditional bean soup with Egyptian pita bread called aish baladi, hummus, salad, and from the mains we ordered grilled chicken and, red meat koftas. The soup, chicken and koftas were par excellence; a perfect way to end our time at Luxor.